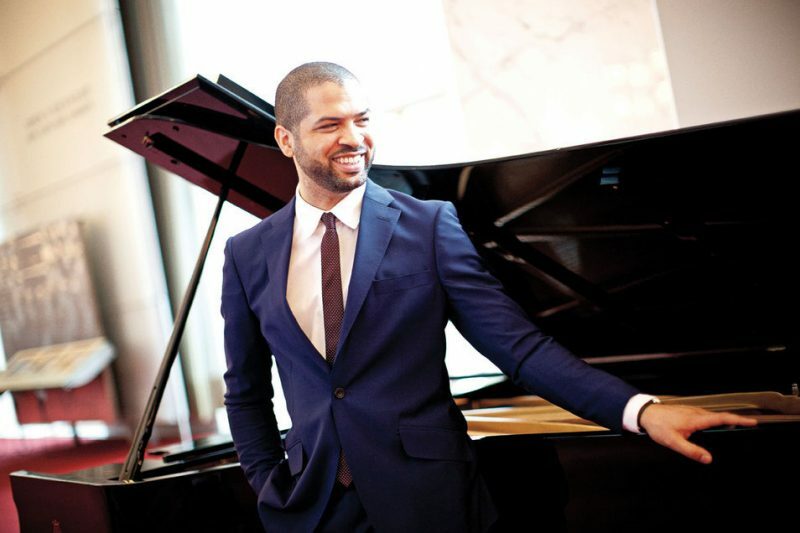 It’s a little after 5 p.m. on a blazing Wednesday in June, and Jason Moran is seated in a chair at his studio space on the top floor of an East Harlem building. The tall, sturdily built pianist is dressed in a faded T-shirt and fitted jeans-and dig the accessories: a pair of limited-edition Blue Note Records Adidas high-tops and a white straw fedora. Outside, garbage trucks amble into a depot on Park Avenue, their stench swelling in the summer heat. The Harlem River quivers, gray and aloof, in the distance. Every few minutes, a Metro North train clamors by on the elevated tracks, and you have to either pause your conversation or put some heft into what you’re saying. By the window there’s a Steinway baby grand, which is presently being subjected to a murky rendition of “Don’t Explain,” all redundant harmonies and abandoned tempos, by a 23-year-old student. He hails from Australia, and he got in touch with Moran to request a one-off lesson during a quick trip to the States. The song ends, and Moran offers a few tips. Then he asks a question. “Bill, Jarrett, Mehldau. They’re probably the three,” the kid says, though he really didn’t have to-this much was already clear. Not really, the student admits. 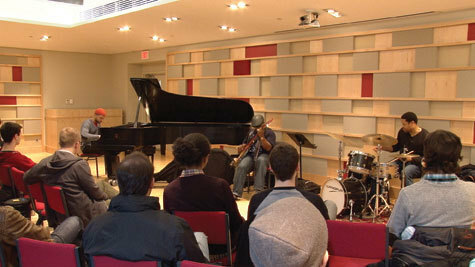 When Moran was his pupil’s age, he had just graduated from Manhattan School of Music. He got wind that the saxophonist Greg Osby was looking for a piano player, so he showed up at one of Osby’s gigs. “We talked, and it was a great conversation. It lasted for three or four hours, into the wee hours,” Osby remembers. “He detailed specific things about canons, and his approaches. He literally rattled off a whole history of the piano. I was surprised, because of his age and his generation.” Without hearing him play, Osby knew this kid must have language. He told Moran he was hired. All of which puts Moran, 37, in a qualified position to pick up the mantle from jazz’s earlier standard-bearers and represent the music to the greater public in an artistically diversified age, as he is increasingly being asked to do. Today, jazz seems to have emerged from decades of tail-chasing and fatalism, a long winter when the process of defining itself as an “art music” deepened internecine divides. By now it’s become comfortable with its position on the cultural margins, and is beginning to appreciate the privileges that come with being able to comment on the mainstream from afar. Moran has spent the past decade investigating how jazz can learn from hip-hop, and how the global art world might benefit from some added exposure to creative black music. He’s also become a masterful educator, equipped to carry on jazz’s greatest tradition: that of regeneration. This past year may have been the busiest of Moran’s life. In November, he was named the Kennedy Center’s artistic advisor for jazz; since then, he’s been shuttling to and from D.C. for planning sessions and meetings. At the Whitney Biennial in New York last spring, he and his wife, the operatic mezzo-soprano Alicia Hall Moran, presented BLEED, an incandescent five-day torrent of music and performance. It was a rousing success, and its impact on the worlds of jazz and performance art may take years to fully assess. All of this was heaped on top of Moran’s duties as a faculty member at both New England Conservatory and Manhattan School of Music. Then there’s his regular schedule of performances as an international jazz musician, and rehearsals with a wide scope of collaborators. The day after Moran gives the lesson in his studio, conceptual art icon Joan Jonas will come by to work on a piece that they’ll present in September at dOCUMENTA (13), Germany’s preeminent modern and contemporary art exhibition, which takes place every five years. 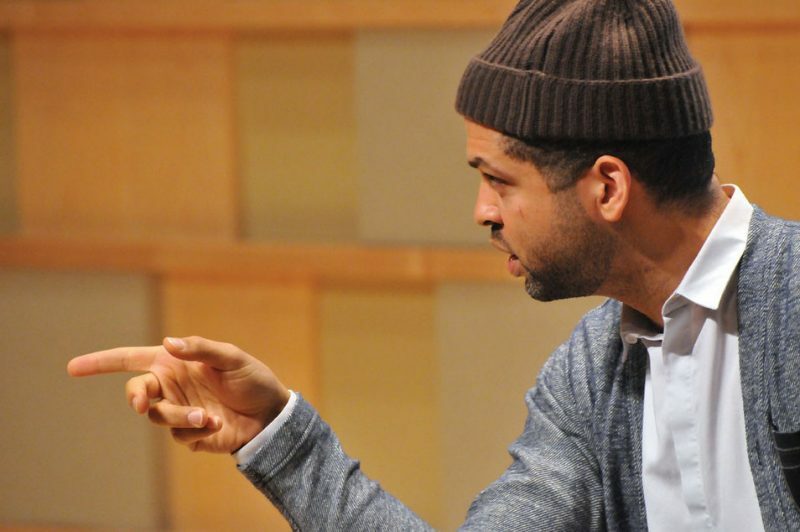 Jason Moran was born on Jan. 21, 1975. He grew up in Houston, where his father was an investment banker and his mother a teacher who also worked for a time at a family bakery. Starting at age 6, he was trained in the Suzuki piano method, which focuses on learning Western classical pieces largely by ear. He was a reluctant student, but he learned to let absorptive hearing be his guide, something that has defined his career. It wasn’t until Moran was 12, when Public Enemy’s first hit song invaded the airwaves, that his abiding love for music took hold. “I just said, ‘What is this?’ It sounded so strange,” he remembers. “It was probably like hearing Trane and Charlie Parker” for the first time. The next year, Moran heard a recording of Thelonious Monk playing “‘Round Midnight” coming from the speakers in his parents’ room. As Chuck D and Flavor Flav’s bristling rhymes had inflamed his imagination, now Monk’s pummeling, idiosyncratic playing gave him cause to love the piano. He taught himself to improvise from a boogie-woogie book, and the next year he started studying jazz at Houston’s High School for the Performing and Visual Arts. Moran was early to understand the importance of creativity’s context, partially thanks to his immersion in art history. As he began to think about what college he wanted to attend, he says, his goal was “to get knowledge first-hand, from somebody who knew all the people that I was enamored with.” For him, that meant Jaki Byard, an avant-gardist who had played with Eric Dolphy, Rahsaan Roland Kirk and Charles Mingus but maintained an intimate relationship with early-20th-century stride piano. When Moran found out Byard was a teacher at Manhattan School of Music, he secured a partial scholarship and moved to New York to attend. “Jaki Byard seemed to represent everything-all tradition, all modernism, all conceptual ideas-and also have the facility to apply all of it without it ever feeling odd,” Moran says. “He kind of taught me in that way: He taught me tradition and history without wagging his finger in my face.” (Moran probably didn’t need much admonishment; he was the kind of student who, anticipating Byard’s emphasis on stride technique, had spent his senior year of high school teaching himself Art Tatum arrangements.) Moran’s studies didn’t end when he graduated in 1997. He soon started taking lessons from Andrew Hill and Muhal Richard Abrams, pianists who, like Byard, had helped define their eras by going against the grain. In 1999, Moran released a well-received debut, Soundtrack to Human Motion, with a quintet that included Osby and Harris. The next year, he circled back with Mateen and Waits to record the trio document Facing Left, his sophomore release. Whereas Soundtrack had focused almost exclusively on fleshing out Moran’s compositions, Facing Left sprung from a different m.o. The trio, which would later be billed as the Bandwagon, covered tunes by Duke Ellington, Björk and Byard, plus a couple classic movie themes; fewer than half of its tracks were Moran originals. The focus this time was on the trio’s interplay, sparky and robust, floating in the uncharted waters between Cecil Taylor’s mercurial and tempo-warping free jazz and the rigid rhythms of sample-based hip-hop. The tunes themselves mattered less than the group’s treatment of them: sophisticated, impish and reactive. And as a pianist, Moran came into his own on this record. Helming the trio, he made a subtle mockery of postwar jazz’s established roles for the right and left hands. In the right, he defied the bebop ideal of linear, melodic playing, and opted instead for a spiky, painterly expressionism that ranged across the whole keyboard. For the past 12 years, the Bandwagon has been expanding and perfecting its combustive rapport. Ten, the trio’s latest album (Moran says he’s always proudest of his latest work, “otherwise, why do it?”), was released in 2010. The record earned best-of-the-year honors from JazzTimes, DownBeat, NPR Music and the New York Times. That same year, Moran was awarded a MacArthur Fellowship, a no-strings-attached, $500,000 grant in recognition of his contributions to jazz and the performing arts at large. Bleed, the weeklong takeover of the Whitney’s fourth floor that occurred this past May, offered a total immersion in the philosophies that guide Moran as both artist and instructor. It was the culmination of his work to date as a multimedia artist, one who has been commissioned by the Philadelphia Museum of Art, Jazz at Lincoln Center, the Walker Art Center, Chamber Music America and others, and has created work with conceptualists like Glenn Ligon and Adrian Piper. At the same time, it wasn’t primarily his doing. None of his projects, in fact, are independent visions. Given the opportunity to proclaim themselves over the course of a week at one of the nation’s top museums, the couple didn’t go in for one mammoth installation. They invited artists and thinkers with whom they’d collaborated-or whom they felt had otherwise fed their artistry-to play music, give lectures or perform in some other way. And they invited dozens of them. Moran led a group in performing “RAIN,” a long-form piece that had originally been commissioned by Jazz at Lincoln Center to celebrate and reconstruct the ring shouts of African-American slaves. The Bandwagon conducted an open rehearsal, with headset microphones connected to a PA system so that everyone in attendance got to be in on the group’s process. Visual artist Kara Walker, recast as the singer Karaoke Walkrrrr, joined the Bandwagon for a scathing rendition of the Rolling Stones’ “Brown Sugar,” with an assembly of words projected on a screen behind her that threw stark light on the song’s racially impudent lyrics. Hall Moran lay on a massage table while her acupuncturist performed treatment on her, and the two had an on-the-spot conversation about her fears and motives for making art. The goal of this bender for the senses, Hall Moran tells me, was to “set up a thing where we feel encapsulated and then dispersed” by their fellow artists and friends. That’s where the name, BLEED, comes in, as both a perfect title for this project and a window into the couple’s working method. It made the argument that artists ought to live among a family of blood brothers and sisters, with inspiration flowing across mediums. In pieces like “RAIN” and “Phenomenal Listening”-a short video that Clytus’ team assembled around a James Baldwin quote-it also examined the Morans’ ancestry and heritage, the bloodlines that feed their music. And the fearless assertiveness of the weeklong residency articulated the couple’s approach to art making: bleed out. “It has to be scary. You have to be scared. And at all those performances, we were scared,” Moran says, laughing. “What Alicia does as a performer is to tap into places that 99 percent of performers will not try to tap into, extremely personal places that she shares with audiences. It’s deep, you know? Because it becomes so vulnerable … it also lets the audiences’ shield down as well. It’s beautiful.” He’s not just kvelling; he is letting you in on something he’s learned to aspire to. It’s what the Bandwagon reaches for, in every single performance. Betty Carter died in September 1998, but the Kennedy Center decided to establish Jazz Ahead as an annual program, the core of its jazz education apparatus. This year is Moran’s first as the center’s artistic advisor for jazz, meaning he is now in charge of Jazz Ahead. It gives him a fresh opportunity to address some of the ills he perceives in the academy’s pedagogy. “Within school they don’t really teach you about blues. It wasn’t discussed really at all where I went,” he says. “It’s a tragedy.” When Moran teaches, he says, he discusses the music that forms the taproot of the jazz tradition “all the time.” At Moran’s Jazz Ahead, as it was under Carter, discussions of the music’s foundations will mingle with a strong focus on individual exploration. Moran wants to liberate audiences to explore and expand their own tastes, too. For his inaugural season of jazz programming, which kicks off in October, he has lined up the center’s most varied performance schedule in memory, with artists like Anthony Braxton, Kris Bowers, Medeski, Martin & Wood and Eddie Palmieri. He hopes to set up pre- or post-concert conversations between artists, so that they can discuss their work in front of audiences, “to make sure that [listeners] are included in how to discuss jazz,” he says. Moran has another big idea about audience engagement, one that’s more elemental and thoroughly couched in jazz history. He wants to make people dance. In order to do it, he’s dreamed up a way to fit a new, makeshift venue into the cavernous building. It’ll be called the Supersized Jazz Club, housed in the center’s atrium, and decked out with a dance floor, full bar and high-top tables; overstuffed couches and a handful of chairs will be the only seating. One of the three shows there this season will be Moran’s own Fats Waller Dance Party, a program he debuted at Harlem Stage in 2011. It updates the stride pianist’s famous Depression-era dance music through a warp of backbeats and knifing horn arrangements. Moran’s goal, in his openhearted performances, his teaching and his new role as an administrator, is to level the playing field. Jazz has a habit of peering down its long nose, but he’d rather face people eye to eye. By the same token, when it came to selecting acts for the 2012-’13 season, it would have been convenient-some might say laudable, even-for Moran to use the opportunity to assume the helm of a new movement, assembling a bold and postmodern lineup of young crossover acts. By now, the jazz world has plenty of those to choose from, and many presumed he might. Instead, he opted to welcome a strikingly broad spectrum, putting special emphasis on an aging generation of jazz stars who have scarcely been seen at the Kennedy Center. In the process, to a certain degree, he removed himself from the spotlight. “One of the generations of folks that haven’t had as much attention-and that Jason is shining the spotlight on through our programming this year-is the generation that came to the fore in the late ’60s and early ’70s,” Struthers says. “It’s important to continue to look at those folks because they, as Jason pointed out, are having an influence on contemporary music today. These are the folks like Lonnie Smith, Dave Holland, Kenny Barron and Anthony Braxton.” All of those names are part of the upcoming season, as is Charles Lloyd, the 74-year-old saxophone great whose quartet includes Moran. During that Wednesday afternoon lesson with the doe-eyed student, Moran makes constant reference to his mentors. It’s clear he doesn’t view himself as an elder, not yet. Maybe he’ll never want to-he so cherishes the pursuit of fresh knowledge that is the right of a perpetual student. When he reminds his pupil of how important it is to know all the angles of jazz’s history, Moran insists he’s only passing on received wisdom. “This is not even coming from me, but from my teachers. They’d say, ‘Do yourself some service and start putting [older recordings] into the list of things that you’re listening to,'” he says.